LaTashia Perry is a modern day renaissance woman. Some may even refer to her as a Virtuous woman. 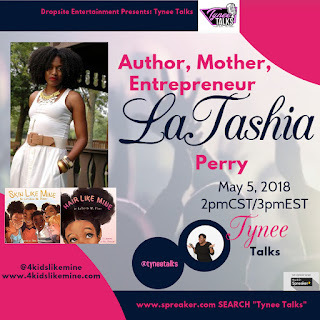 She is a wife, mother of 5, children's book author, Lactation Coach, hair stylist, fashion stylist, and entrepreneur. I'm not sure if she's actually Diana Prince, moonlighting as LaTashia, but it's safe to say that this woman is definitely a WONDER. Mrs. Perry is strong enough to bear the children and get back to business. Listen to my latest Tynee talks Podcast interview with LaTashia as she talks about what prompted her to write a children's book series centered on the likeness of African-American children, her adventures raising five kids ranging from ages 20 months to 15 years old, and balancing a business, all while finding alone time with her high school sweetheart husband Virgil. Inspire enough rest to guarantee your body Kerry Washington Wrinkle Cream has room schedule-wise to fix your dry skin. Skin laser treatment can expel your current wrinkles in no time flat. Notwithstanding,special info relatively few individuals need you to realize that you should utilize a few creams and the last outcomes will take as long as two months to show up.